Silver jewelry can present a man of any age. Unlike gold jewelry, silver chains are considered more versatile option. Bright precious metal is easy to combine with casual and business clothes and can not afford to buy the silver chain can practically everyone. To purchase a gift chain silver for men, consider the simple recommendations. A wide range of silver chains to satisfy the most demanding customers. But when you buy affordable jewellery you must consider not only design products, but also its length, type of weave, a sample of the metal and, of course, the cost. What a chain of silver best buy for men? Stylish silver chains, depending on the complexity of the weave can be worn as an independent ornament. The product with concise design suitable for combination with pendants, crosses and other options for pendants. You can buy a chain with a pendant on which is engraved a man's name, or zodiac sign. 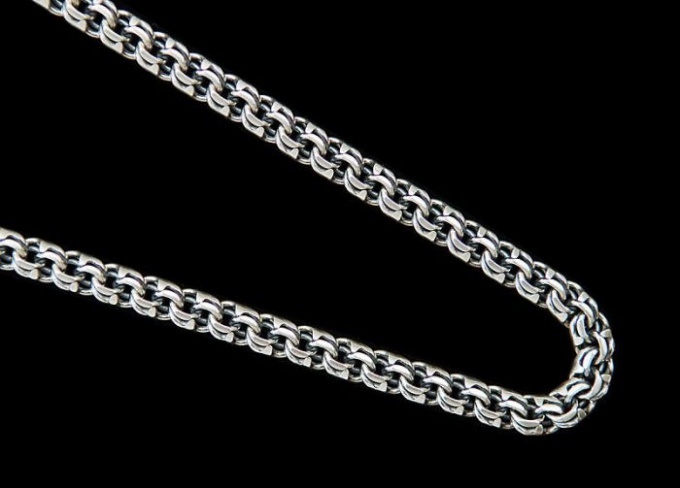 Massive silver chains rarely do, so for men is to choose a product of average thickness. For men, the best option would be a chain with a tight weave, for example, tubular. Or classical solutions with braided "Diamond". You need to take into account that are simple chains of silver is easier to repair in case of breakage, difficult techniques require painstaking work and great skill. Always original look of the model with black, as well as combined chains with yellow, red or white gold, tin. Popular anchor netting, Bismarck, Celtic and other techniques. For men, you must choose the right length chain in sterling silver. Standard jewelry for men length is about 55 cm In any case the product must not cause discomfort when wearing, need to take into account the type of weave, because the chain can be double or even triple. The value chains of precious metal will be directly calculated based on the sample of silver. Common are made of silver 875 samples, this metal is considered the most durable. Can be found and a chain of 925 sterling silver, this durable and soft metal. Consider the reliability and ease of opening/closing of a padlock of the chain that is supposed to be a gift to the man. He should not cling to the skin. If you wish a chain for a loved one, dad or brother can be done to order, in this case, it will take into account all wishes of the client. Chains of silver have the potential to become a favorite decoration for men, and to give this product almost for any occasion.